1645 square feet of living space with 3 bedrooms and 2 full baths. Located on the 10th floor. Hardwood floors throughout the entry, living room, dining area, and kitchen. In-unit laundry, garage parking, and storage unit included. To request a private showing for 111 N. Ashley #1008, or to learn more about this luxurious condo, contact us at The Bouma Group, Realtors today at 734-761-3060 or info@bouma.com. 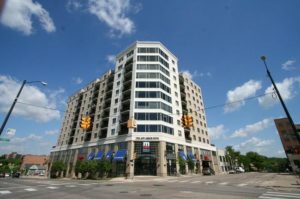 View photos and amenities for Ashley Terrace condos here!